Administrators and faculty at the University of Massachusetts officially opened the Isenberg School of Management Business Innovation Hub in a ribbon cutting ceremony on Friday afternoon. The$62 million addition to the business school, which has been open and in use since January of this year, brought faculty, students, community members and donors together to celebrate the new academic facility. UMass Chancellor Kumble Subbaswamy was introduced first at the ceremony by Catherine West Lowry, a senior lecturer of accounting and an Isenberg alum. Subbaswamy explained that the new building was part of a larger plan by the University to focus on “strategic excellence” as it aims to become a top-ranked public school. “The Business Innovation Hub is an exciting, physical representation of our successful trajectory and our evolution,” he said. Subbaswamy explained that the school needed to expand its facilities to adequately compete with current leaders in public schools. But not only would the addition help solidify UMass in national rankings, it would also add to the University’s goal to be a reliable in-state solution for students. As a popular contributor to “the Massachusetts innovation economy,” Subbaswamy said, UMass not only produced student talent but also valuable industry research. The new Isenberg addition, he told the audience, would strengthen the school’s relationship with businesses in Boston. Next to speak was Victor Woolridge, chair of the University of Massachusetts Building Authority and member of the Board of Trustees. Woolridge explained that the new facility would move all of Isenberg’s academic departments into one building. 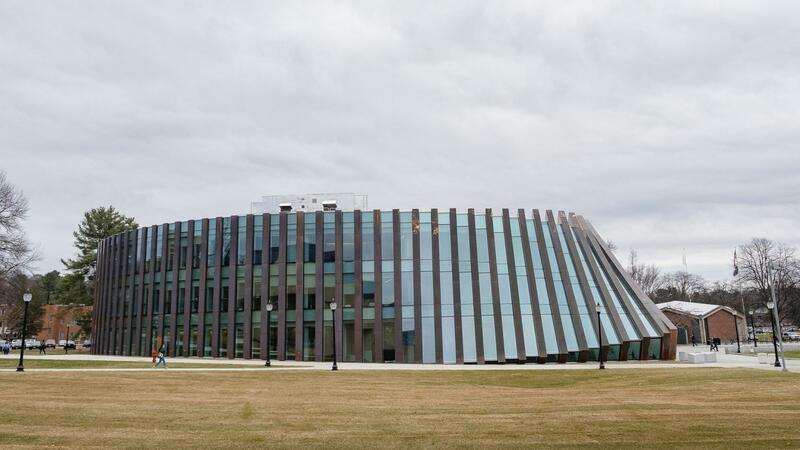 “With this project, UMass Amherst further distinguishes itself as the vibrant flagship of the University of Massachusetts, dedicated to engage learning, entrepreneurship and innovative research,” Woolridge said. Nefertiti Walker, associate dean for an inclusive organization and associate professor of sport management, told the audience that the facility doubles as a space for Isenberg to explore diversity initiatives. Among other events, the hub will serve as the location for a day-long inclusive leadership conference next fall. “Business schools of today must provide the space for leaders of the future to embrace diversity and cultivate inclusion,” Walker said. New interview rooms and conference spaces will provide students with the opportunity to collaborate and discuss topics like bias, gender discrimination, racism and generational intersectionality in business, she said. Bjarke Ingels, a founding partner and the lead design architect of the Business Innovation Hub, said ideals like collaboration were some of the main considerations when designing the building. Natural lighting from the building’s open courtyard gave life to the space, he said. One of the final speakers at the event was Katarina Maric, a senior studying operations and information management who said she had already used the interview suites in the building to help land her a job for after graduation. “I’m thankful to have had at least one semester using it, and [I’m] jealous and excited for all the students to come,” Maric said. After closing remarks by Thomas Moliterno, interim dean of Isenberg, key individuals on the project including Subbaswamy and Ingels walked outside to officially open the building with a ribbon-cutting. Michael Connors can be reached at [email protected] or followed on Twitter @mikepconnors. That is not going to make umass a top ranked school lol. That has absolutely no relevance in business. Business is about money, not far left politics. If anything busines should be encouraged to stay away from those issues and be apolitical. These are far left political ideas. Businesses that have made political decisoins like Target,Starbucks, and Gillete have lost lhundreds of millions in shareholder value.A smart business person might pretend to care about an issue, but stays apolitical because upsetting either side means losing customers. While I’m sure someone appreciates your insight, you are misguided. Understand that business is about building interpersonal trust and brokering deals based off of mutually advantageous terms. To be more clear: people turn down deals with people they don’t like. Your examples of the major businesses making efforts to be political is not because no one wants politics in business (there is politics in everything) but most consumers see their efforts as a shallow pandering, and have reacted accordingly. That does not mean it does not matter. I encourage you to take advantage of the spaces that will help propel UMass into the future and understand that all of the things you dismissed, including spellcheck, are important for success.